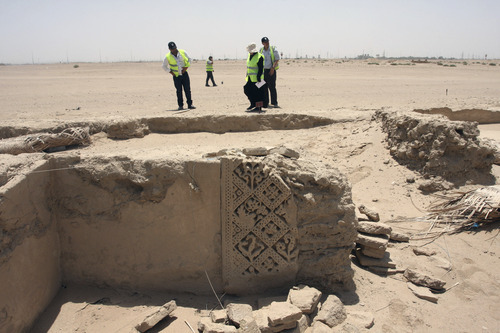 A hundred meters (yards) or so from taxiing airliners, Iraqi archaeologist Ali al-Fatli is showing a visitor around the delicately carved remains of a church that may date back some 1,700 years to early Christianity. The church, a monastery and other surrounding ruins have emerged from the sand over the past five years with the expansion of the airport serving the city of Najaf, and have excited scholars who think this may be Hira, a legendary Arab Christian center. 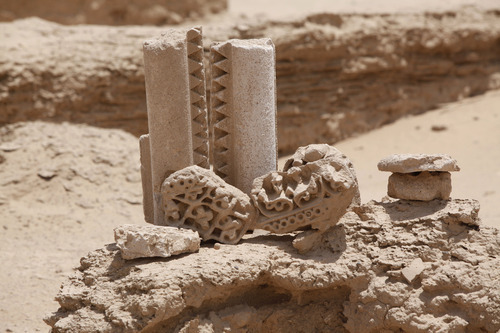 "This is the oldest sign of Christianity in Iraq," said al-Fatli, pointing to the ancient tablets with designs of grapes that litter the sand next to intricately carved monastery walls. The site's discovery in 2007 and its subsequent neglect are symbolic of a Christianity that has long enriched this country, and is now in decline as hundreds of thousands have fled the violence that followed the U.S.-led invasion in 2003. At the same time, the circumstances of the find reflect a renaissance for Najaf, a holy Shiite Muslim city. The airport expansion that revealed the ruins was needed because Najaf attracts multitudes of pilgrims. The ruins left in the baking heat are within the airport perimeter and relatively safe from vandals and looters. The site's stone crosses and larger artifacts have been moved to the National Museum in Baghdad. For al-Fatli, it's all very tantalizing. "I know if we were to work more, we will find more and similar churches," he said. But there is no money to mount a proper dig, he laments. In a country where bombings constantly kill people and much of the populace lacks reliable electricity or clean water, archaeological preservation is a low priority. Today, the Christian portion of Iraq's population of 31 million has fallen from 1.4 million to about 400,000, according to U.S. State Department data. Caught in the sectarian violence of 2005 to 2008, massacred by Muslim militias as heretics, "We were in the worst of times," says Younadam Kanna, a Christian member of Iraq's parliament. He says the exodus has slowed but the future for Christians remains uncertain. Still, he says, for those who remain, the discoveries at Hira provide some hope. "It shows we can live together in peace with Muslims -- because we did for centuries before," he says. "When Islam first came to Iraq, the Christians here welcomed them." Legend traces Christianity in Iraq to Thomas, one of the Twelve Apostles who fanned out to spread Christ's word after the Crucifixion. Historians believe Hira was founded around 270 A.D., grew into a major force in Mesopotamia centuries before the advent of Islam, and reputedly was a cradle of Arabic script. Lying 160 kilometers (100 miles) south of Baghdad, it was lost to Iraq's southern desert for centuries after Christians were driven out of the area by Muslim rulers. Erica Hunter, a professor of early Christianity at London's School of Oriental and African Studies, says historical evidence shows that by the early third century, the faith was well established in what is now southern Iraq by the Lakhmid dynasty, an Arab kingdom whose final ruler converted to Christianity. For centuries Hira was an important center of the Church of the East, sometimes known as the Nestorian church, whose modern offshoot, the Assyrian Church of the East, is still followed in Iraq. Hira, also called al-Hirah, lay near the Sea of Najaf, since vanished, and was renowned as an idyllic retreat. 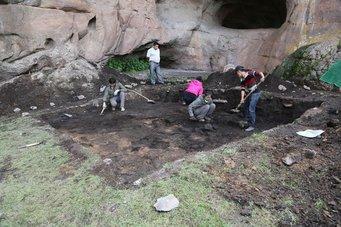 Archaeological finds have been traced in the 1900s, but the evidence is limited. Hunter, one of the few scholars to explore the other sites linked to Hira, studied the Syriac inscriptions found by a Japanese-led team in the 1980's. Other traces of Hira include two churches excavated in 1934 by an Oxford University team. Several church sites were mapped by German archaeologists in the 1980s before the 1991 Gulf War curtailed new exploration. Hunter is cautious about claims the newly discovered ruins are Iraq's oldest church, but adds, "They certainly must be very, very early," perhaps dating to the fourth century dating. What is clear is that Christianity at Hira continued to thrive alongside Islam until at least the 11th century, hundreds of years after the Muslim conquest of the area. Eventually the region's Muslim rulers began persecuting the Christians, and Hira's churches were abandoned. Most remaining Iraqi Christians today are clustered in Baghdad, Mosul, Kirkuk and the self-ruled Kurdish north of Iraq. Al-Fatli, himself a Shiite, thinks of those 40 lost monasteries as he surveys the desert around the abandoned Najaf excavation. For now, though, Christianity's lost city in Iraq will remain mostly a mystery. But lawmaker Kanna says there's still time to uncover it. After all, like the remains, Christians in Iraq have endured for some two thousand years. "This is our country. We will be here," he says. "We'll be here not only for one more century, but for many centuries to come."